One of AKP's summer cocktail favorites is Yogurt Soju! Depending on how you enjoy the strength of your alcoholic beverages, you can make this with two easy ingredients: Chamisul and your favorite brand of yogurt drink! We recommend adding something sparkling like San Pellegrino or Sprite to add an extra element to the drink. Tangy and sweet with a punch! Nothing says summer like a refreshing mojito, but what better than to use Chamisul as the base for this tasty drink? 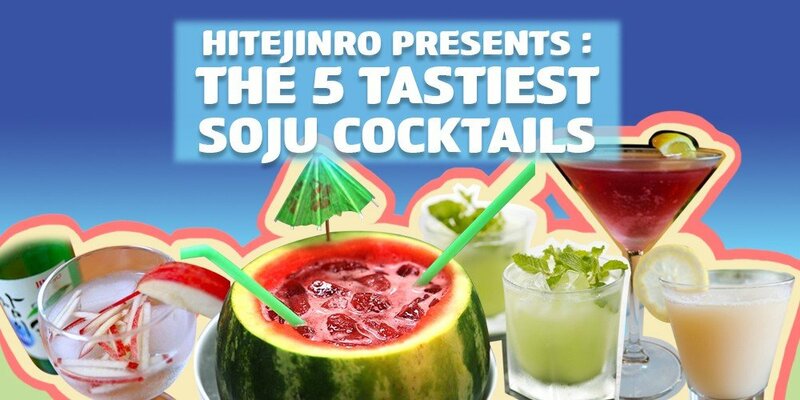 Using soju makes the drink light and easy-to-drink over conversation outside in the warm sun! Use fresh mint leaves, sparkling water, club soda, or Sprite, and Chamisul to create this tasty drink. Want more customization? Add in slices and the juice of some of your favorite citrus fruits like orange, lemon, or grapefruit. Equally as simple as the previous recipe, chef Bobby Flay popularized this recipe for an Apple Soju cocktail. The drink calls for equal parts soju to apple juice and a splash of seltzer water or Sprite for bubbles. Garnishing this drink with ripe Honey Crisp or Granny Smith Apples adds an additional layer of flavor! This is a fun one for parties or bigger get-togethers! Instead of presenting a pitcher of beverage, why not make the fruit you're using the pitcher itself? By scooping out the center of a watermelon and blending it, you get delicious and refreshing juice that not only hydrates your body, but quenches your thirst! Mix Chamisul in 1:1 with the watermelon juice and put it back in the melon with some ice to serve as a fun drink to get the celebration of summer going! Cosmopolitans are fruity, delicious beverages for the refined bar patron. However, with soju, replacing the vodka, this makes for a delectable drink with an Asian twist. Combine Chamisul with lime juice, a bit of triple sec, and cranberry juice. Shake or stir to your liking and add ice. Enjoy this one with cute fruit garnishes and finger foods. Best served cold. This article is sponsored by HiteJinro.